Visit the Condofish website for the latest project information and check them out on Facebook too! Costa Rica is internationally known and recognized for its policies concerning the preservation of its natural habitats, its vast biodiversity and its extensive national park system. Tourists come from around the world to visit these protected zones, which have expanded to include massive expanses of marine territory. Costa Rica’s revered Coco’s Island is one of the top diving destinations in the world, and the epitome of the country’s goal to values and protect the diverse animal species living within it. The world’s oceans have suffered a drastic loss of habitat for fish, corals and other marine life. This can be attributed to a range of factors, including: overfishing, pollution, shark finning, general disregard and natural disasters – like the recent BP oil spill. Guanacaste’s Playa Hermosa Association, yearly winner of the Blue Flag award, continually strives to maintain biodiversity and natural beauty of the area. One of its 2010 goals was Condofish, the development of an artificial reef around a recently discovered shipwreck in the bay. MINAE granted the association an official permit from the government to build this reef, making it Costa Rica’s first nationally supported project of its kind. Condofish has been thoroughly researched, planned and designed. Some reefs are erroneously constructed from car tires (a bad idea due to the toxicity of rubber disintegrating in salt water), and some are built using broken-down cars. Our goal was to ensure that fish and other marine animals, such as crabs, octopus, and eels, looking for a place to live and reproduce had the best environment available. The reef project chose cinder block because the block was much easier to handle than cars and other heavy industrial items. Also, logistically it made more sense because block is readily available. The fish habitats are formed into an “igloo” and “caterpillar” shapes which offer the best environment to live, breed and find protection. In 1985, a 60-foot tuna-fishing vessel of Mexican origin was anchored close to the beach in Playa Hermosa. A fire broke out aboard causing considerable damage and the boat sank. In 2002, fishermen living in Playa Hermosa knew the location of boat and helped discover the wreck and the remains of the fishing vessel. The wreck has a N-S direction. To the south is a drum with nets and ropes completely covered with vegetation and corals, at the center is the engine and various mechanical parts of the arms. At the other end, the north, one can see a metal cube of about 100 cubic feet that is most likely a fuel tank. The wreck lies about 400 meters west from the beach, facing the parking lot of the first entrance to Playa Hermosa. 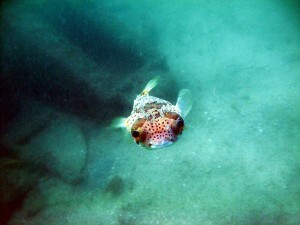 It sits at a depth roughly 20 to 30 feet depending on the tide. 12 fish habitats consisting of the igloo block structure will be located around the wreck. The marine life currently around the wreck is well established. We have established a list, but it is not complete we will be working with local and other marine biologists from other countries to assist in identifying all of the species housed there.A final list will be forth coming. There are so many schools of tiny fish,”Fry”, that our local diving club decided to name this dive site, THE NURSERY, Spanish, EL VIVERO. It is obvious that many species of fish use this site for spawning, reproduction and protection.We are looking to established contacts with different universities to meet with marine biologists with the hopes further identification and other scientific aspects of the project. The association hopes that this site is used by divers but also notes that the site is accessible by snorkeling from the beach.. The reef project will continue in a phased approach. Phase one, the current phase, is to establish 12 fish habitats(completed). Phase 2 will be to seek permission from the government to increase the size of the reef to allow greater development of local marine life. Phase three will be to provide fish habitat to the north side the beach closer for snorkeling trips. The beauty of Playa Hermosa is that it consists of flat sandy bottom, which is conducive for concrete sphere habitats.